As nocturnal flying mammals, bats have developed a unique and very efficient means of navigating in the dark: sonar, or echolocation. Although the acoustic signals they emit are inaudible to the human ear, they can be perceived, recorded, and analyzed with appropriate equipment and software. In this book, Michel Barataud synthesizes more than two decades of research on acoustic ecology and bat sonar physics and detection. Highlighting technological advances, Barataud shows how he has developed an ever more efficient identification method using an initial, purely auditory approach (a bat detector ) complemented by computer-assisted analysis of the ultrasonic signals. By following Barataud s method and the data provided, readers will be able to identify about 85% of European bat acoustic records, including all the most widespread species, as well as carry out non-invasive bat inventories and research. 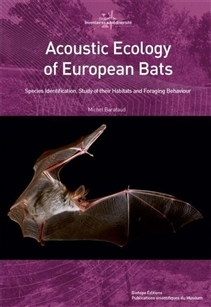 Including a DVD of more than 300 audio samples and scatter diagrams of sonar emissions to aid in species identification, and featuring a contribution by bat sonar pioneer Yves Tupinier, "Acoustic Ecology of European Bats" will be an invaluable resource for all scientists of Chiroptera." Czy jesteśmy dość mądrzy, aby zrozumieć bystrość zwierząt?